Well the second semester is nearly over. In fact as I am writing this I only really have one more final to take and its for my A+ class. My first online course, intro to Microsoft Office, went pretty smoothly. Really I just needed to set aside about 3 hours to do the 3 assignments a week, every week, in order to complete the course on time; not a problem. I found it funny that it wasn't until the very end of my Active Directory class, when I was completing the final exam, that I started truly appreciating it. You could almost say I started liking it. Cisco went by fairly well. It still seems to be the class that I love everything about. I spent half the semester coming in to complete the labs hands-on with physical machines as apposed to using packet tracer. It's not that I don't like packet tracer, I just liked mixing it up really and working with different tools to complete the same job; keep it diverse. Sociology was, well sociology, but I did get a chance to shine with some of the tools I learned about from my first semester Business & Social Media class. We had a pretty big sociology project to complete with about 9 people and using Google drive as a collaboration tool absolutely helped. Since I was the tech guy of the group I offered to coordinate the presentation and correspondence. While we are still waiting to get the final grade on it, I think it went over really well in the end and I'm sure we got a good grade on it. That just leaves completing the A+ final and my second semester will come to a sweet sweet end. I wish I could say I could relax for a few months but, well I can't. I will be having one summer class to take (Eng 202). Originally I wanted to take two classes but with the Cisco Live Florida event fast approaching I just don't think it will be possible. Going to Florida will already make me miss a week of summer class as it is. So while I'll be waiting for my summer classes to begin in early June I will be rigorously studying for the ICND1 for my CCENT certification. One of the perks of getting to be part of the dream team at Cisco Live is we are given full event passes. And one of the perks of having a full event pass is that we get to take a Cisco cert exam of our choosing for free! So naturally I need to take full advantage of that. 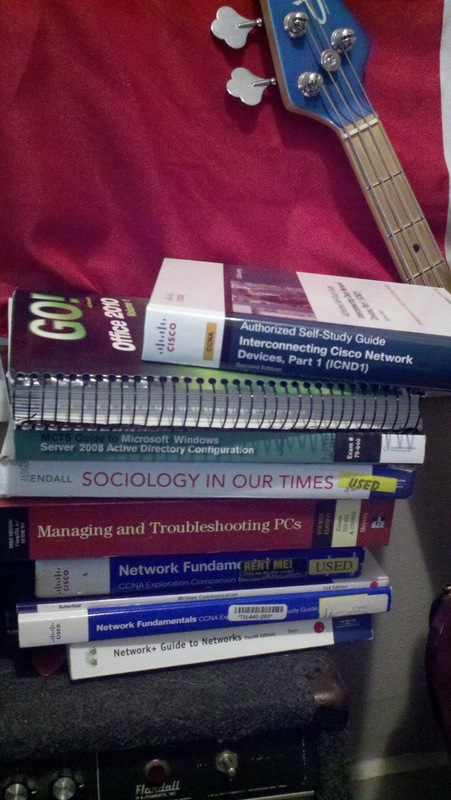 Since I am now done with CCNA2 I'm ready to take a shot at it. Also this is a great opportunity to get to experience the feel of a Cisco exam without having to fork out the money for it. So that gives me about 5 weeks and then I am off to Florida! We've already had our first meeting via Cisco WebEx where we were introduced to the other Dream Team members as well as the managers and instructors that will be there with us. The conference center looks amazing and it looks like they'll have us plenty busy. I am at about an 11 right now on the excitement meter. So when all of this is out of the way it looks like I'll have my first month off since school started for me. I'll need to figure out something for me to do. So far though this semester has been exhilaration. I feel like I'm more involved than ever with my instructors and my education. It's been great so far and I can't wait to see what the next semester brings! Hats off to you Ike for finishing another semester with I'm sure flying colors!! Good luck to you with the Cisco Dream Team experience in Florida! !